Unless you’ve been living under a rock, you’ve probably seen carefree travellers flinging themselves off what appears to be a swing perched precariously on the top of a mountain – feet danging right off the end of the world, so to speak. In reality, the swings are nowhere near as dangerous as they might appear. They’re also easily accessible from Baños de Agua Santa (more often simply referred to as Baños) and make for a cheap day out in Ecuador. So, what are you waiting for? Grab your camera and get ready to swing your way to that perfect Instagram shot! Local bus. Our preferred method, buses in Baños are reliable and easy to use. For only USD0.50 you’ll be dropped at the entrance to the original swing at the end of the world, La Casa Del Arbol (The Treehouse), which is approximately 40 minutes from the centre of town. Buses depart at 5.45am, 11am, 1pm, 2pm and 4pm from Baños (on the corner of Pastaza and Rocafuerte). If you ask the driver, they will happily point out the correct stop for you up the top and advise you of the return times. Hike. There are two main trails that will take you to the swings but neither are particularly direct. Choose to hike towards either Mirador Virgen and on to Runtun or towards Bellavista (before again turning off to Runtun). Regardless of the path you choose, you’ll then continue the hike along the same path to your destination. Allow approximately 5 hours to hike up and back. Taxi. Official taxis are available from Baños but be sure to negotiate a price before you leave town (or insist your driver turns the meter on). Also, decide whether you’d like the driver to wait for you at the top or if you’ll find your own way back down. Hitchhike. Though we don’t normally hitch rides, we started walking back down and a lovely couple kindly offered us a lift. If you’re keen, there will be people going both up and down in private cars. Guided tour. Tours are available from town but there’s really no need to book yourself on one as the area is safe and the other transport options work so well. How Much Does the Swing Cost? There are a number of swings sitting above Baños but La Casa Del Arbol is probably the one you’ll want to make a beeline to. They charge a very reasonable USD1 per person which will give you access to two sets of swings (one more scenic than the other) and a relatively small zip line. First of all, the swings really aren’t as bad as they look! Nathan’s not a fan of heights but was more than happy swinging away. During the peak season, we’ve been told each visitor gets a couple of swings and is the ushered off for the next person to jump on. The beauty of being there in the low season meant we actually got a proper chance to swing (and multiple times at that). It’s worth noting that the back of the swings are a little high – this makes it hard to get momentum up as you would on a normal swing but the concrete ramp below helps with that. Be sure to take shoes with good grip so you can get yourself to the top of the ramp. There’s also a belt which keeps you relatively secure so you can swing without a care in the world! That’s it – no excuses now! Looking To Up the Excitement Factor? Alternatively, there is a larger swing (that accommodates up to three people at a time) on the same mountain. Just start the walk back to town and after approximately 2km, turn left… follow that road for 800m (there are plenty of signs) and you’ll find the massive structure that you’ll easily see lit up at night from town. This monster is less playground-swing and more fun-fair ride so we’d still suggest riding the bus up to the original swing first and then walking down should you want more of an adrenaline rush. Don’t pick this one over the classic. Apologies – we can’t remember the name of the larger swing but you can’t miss it. If you do make it there yourself, we’d love an update please! Though Baños de Agua Santa originally came to our attention because of the ‘swing at the end of the world’, we soon realised there’s so much more to this buzzing little city! 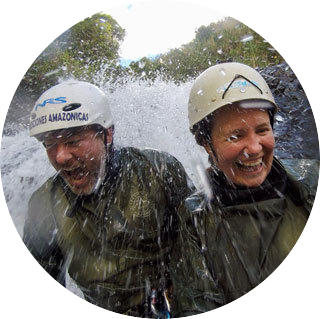 Whitewater rafting, canyoning, zip lining, paragliding – there’s lots on offer in the region and all at unbelievably affordable prices. It was incredibly easy to spend a week in Baños, the perfect mix of small-town relaxation and world-class adventure. Make sure to include a stop in this part of Ecuador when you’re planning your trip to this diverse little country! Whilst in Baños, we recommend staying at Hostal Princesa María. The team there offers some of the friendliest service around and will happily point you in the right direction for the bus and anything else you’d like to do in the city. This entry was posted in Activities, Adventure, Baños de Agua Santa, Ecuador, South America. Bookmark the permalink. Really great info, cheers. Have you got any tips as to the best/easiest way to travel from NZ to Banos? Hey Michael! We got there from within South America but I’d imagine you’ll want to fly to Quito and bus on. Have you checked skyscanner? That’s a great help to compare prices and routes.